Our honorable Vice-Chancellor, Dr. Madhu Chitkara, was invited as an Eminent Speaker, at India’s largest education brainstorm conference – Global Educators Fest 2017 held at Hyatt Regency in Gurugram. Inspiring the next generation education leaders, Dr. Chitkara addressed prominent education visionaries, investors, edupreneurs, media, Government, education policy makers, technology providers and institutions from all across the world. 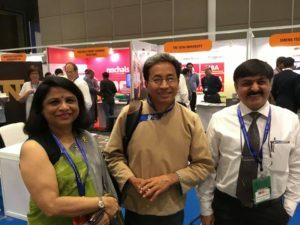 Dr. Chitkara also briefly interacted with world famous education visionaries – Mr. Sonam Wangchuk, founder SECMOL, ( the inspiration behind “Phunsuk Wangdu” of 3 idiots, a Bollywood block buster), and Prof. Sugata Mitra, TED award winner and Principal Research Investigator at Newcastle University, UK. According to Dr. Chitkara, the event was an Unconference where along with information there was practical usable knowledge through live demonstrations, interactive sessions, workshops and exhibitions, which she was an integral part of. The theme of the event was ‘Unlearn the Conventional’, which by and large questioned legacy education and introduced disruption. The fest proved to be a platform to bring about a positive change in the education system. Dr Chitkara met the attendees and had personalised mentor hours with them.